These personalized decorative ceiling fan pull chains can be perfectly matched to your decor and provide an attractive way to distinguish between your fan and light controls. 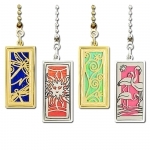 Choose from a selection of unique ceiling fan chain pulls expertly crafted with your choice of hundreds of stylish designs, rich colors, and silver or gold metal finishes. Kyle's custom ceiling control chains may also be used as pull chain attachments on floor lamps, desk lamps, and other light fixtures, too. 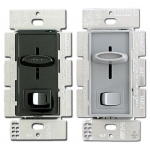 Shop for 3-speed ceiling fan controls and light switches in a variety of colors that can be paired with decorative switch plates for an elegant way to add style to your electrical devices.